By 1960, live action adventure films based on classic literature had become a staple of The Walt Disney Studios. 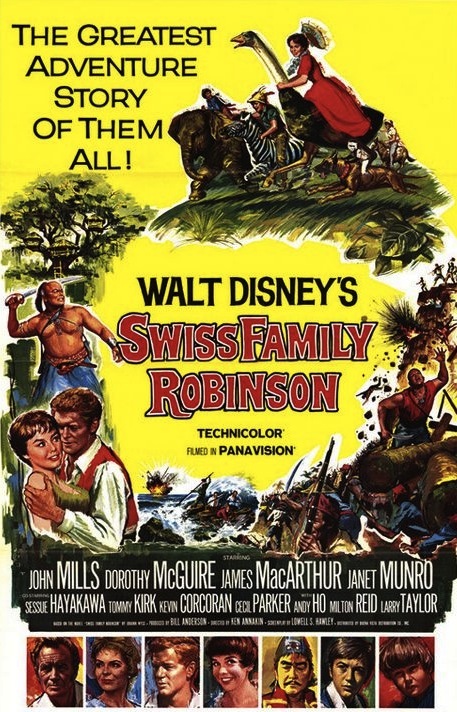 It was only a matter of time before Walt Disney tackled his own version of Johann Wyss' Swiss Family Robinson. The story had only been adapted to the screen once before, by former Disney distributor RKO in 1940. British director Ken Annakin and Walt screened that film for inspiration, which convinced them to take a different approach and also film on location rather than on a soundstage. The Disney version is very loosely based on the classic book. To cast the film, the studio relied heavily on its stable of familiar stars. Dorothy McGuire had previously worked on Old Yeller with Tommy Kirk and Kevin Corcoran, who also played brothers in The Shaggy Dog. James MacArthur and Janet Munro had worked together in Third Man on the Mountain and while John Mills was new to the Disney family, his daughter Hayley made her Disney debut with Kevin Corcoran in Pollyanna. Even the director, Ken Annakin, was a familiar face at the studio, having directed films like The Story of Robin Hood and Third Man on the Mountain. The film was shot entirely on location on an island called Tobago. Some of the artificial locations that were built there, including the tree house, took months to build. Inclement weather, a typhoid epidemic, animal actors and a difficult film crew caused delays in production, which lasted 22 weeks. It was shot in Panavision Widescreen, the first and only Disney film made using the Panavision process, which was similar to CinemaScope.When the film arrived in Burbank, most of the audio was unusable and had to be rerecorded through audio dialogue replacement. The film opens with a ship at sea in a storm that gets stranded when it crashes against a rock. After the storm, a family is able to escape from below only to realize that the rest of the crew and passengers abandoned the ship during the storm to escape pirates that were pursuing them. The oldest son Fritz constructs a raft to transport the family to a nearby island. Father, Fritz and Ernst return to the ship to rescue the livestock on board when the pirates catch up to them. They scare them off by flying a quarantine flag, but realize they won't be safe for long. They build a tree house to keep them safe from the dangerous animals that inhabit the island. Fritz and Ernst explore the island by sailing around it, but when their boat is destroyed they find the pirates who have kidnapped a man and a small boy. They are able to free the boy, who turns out to be a young woman in disguise named Roberta. The family prepares themselves for the inevitable pirate attack as Fritz and Roberta fall in love. When the pirates figure out where they are hiding, a battle ensues. Just when it looks like they might lose, Roberta's grandfather comes to the rescue. However, when the opportunity to leave the island presents itself, most of the family realizes they have everything they could ever want on the island and they decide to stay. Walt Disney's Swiss Family Robinson premiered on December 10th, 1960, and was released for the public on December 21st. Critical reception was mixed. Many snubbed Disney for giving the film a lighter tone than the book and for some of the slapstick humor. However, a large number of critics were able to see Walt's intentions and saw that the film succeeded in being well made, entertaining and memorable. It was the most expensive live action film the studio had made up to this point, costing $4.5 million. I'm sure the finance department was relieved when it became one of the most successful films of the year, grossing $7.5 million at the box office, more than Sparticus and Alfred Hitchcock's Psycho which were also released that year. While most live action Disney films only received one theatrical release before becoming part of Walt's weekly TV series, Swiss Family Robinson was re-released to theaters four times (1969, 1972, 1975 and 1981). It became one of the first Disney films released on VHS in 1982. I first saw Swiss Family Robinson on The Disney Channel when I was a kid and I was instantly delighted by its charm. The appeal for me has only increased through the years and it has become one of my favorite movies of all time. I feel that it has something for everybody; action, adventure, comedy, romance and drama. It's easy to see why it was such a ginormous hit in 1960 and why it has stood the test of time. A walk-through attraction of the tree house was built in Disneyland in 1962, and it was copied at Walt Disney World in 1971, Disneyland Paris in 1992 and Tokyo Disneyland in 1993. Disneyland's attraction has been rethemed to Disney's animated version of Tarzan, but the other parks around the world have kept theirs as the Swiss Family Treehouse. This was Janet Munroe's last theatrical film for Disney, although her last role for the company was in the made for TV film, The Horsemasters in 1961, which also starred Tommy Kirk. Swiss Family Robinson is currently available on DVD in a fantastic 2-disc set, part of the short lived 'Vault Disney Collection.' The film has been fully restored and is presented in its original Panavision Widescreen aspect ratio. Bonus features include an in-depth making-of documentary, audio commentary, a vintage episode of Disneyland that took a look behind the scenes before the film was released, plus production photos and original trailers. The film is also available on iTunes in widescreen, where it can be purchased in HD. However the digital version doesn't include any of the bonus features. You won't ever be charged no matter how many movies you watch during the day.More information on fullfreemovies. If necessary, you can put the frame rate and resolution, along with decide whether you would like to record audio go here. Thanks for sharing. Loved this movie.